If you would like to make an appointment, you can assist us to expedite your check in by submitting this form. After filling out the form below, one our our staff members will contact you to verify your appointment date and time. Thank you for your cooperation in letting us assist you. We look forward to meeting you! Monday - Thursday, every Half Hour, between 9:00 AM - 5:00 PM as last appointment. Saturdays, every Half Hour, between 9:00 AM and 1:30 PM. No appointments on Friday or Sunday available. Please remember this is a request for a preferred appointment time. Someone will contact you to confirm your appointment time. We will do our best to reasonably accommodate you. On the day of your scheduled appointment, please arrive 15 minutes prior to your appointment time. 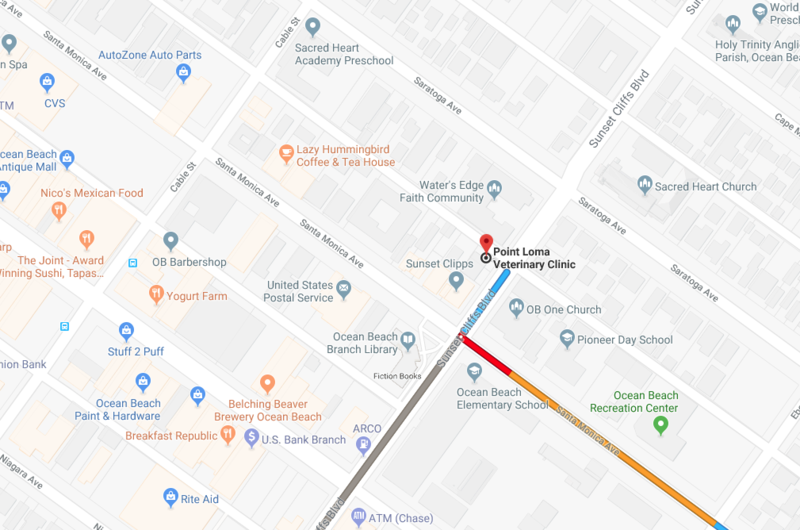 We have reserved parking on the north side of our hospital in the alley between Santa Monica Ave. and Saratoga Ave.
Professional fees are due when services are performed. We accept payment in the form of Visa, Mastercard, or cash. We do not accept debit cards for payments of $10 or less and we do not accept personal checks, Discover or American Express credit cards.